This weeks blog was really really hard. I decided to bake floating islands which is a poached meringue floating on a bed of Creme anglaise (custard). It is a clever recipe because the meringues use egg whites and the leftover egg yolks are then used for the creme anglaise. 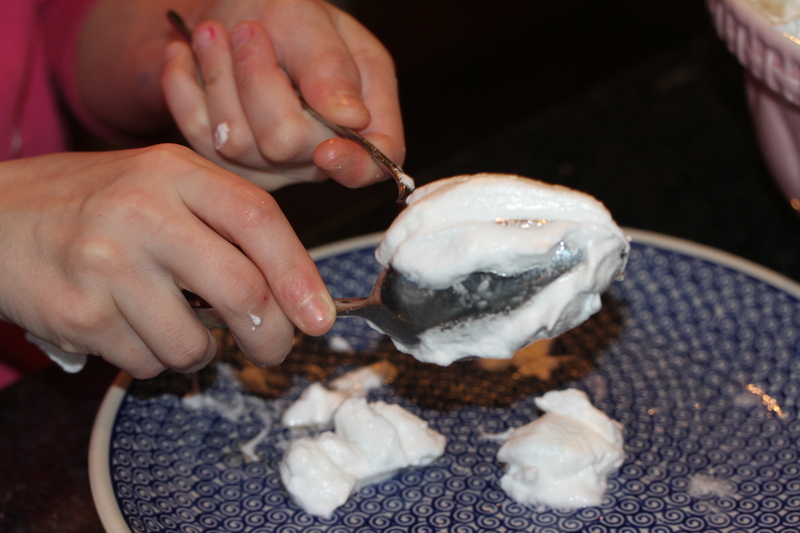 Once I made the meringue mixture I then shaped the meringue into quenelles using two tablespoons. The trick was to keep the spoons wet and clean so that the quenelles were smooth and could easily slip off the spoons and into the poaching liqued which was made up of cream, milk and vanilla bean paste. 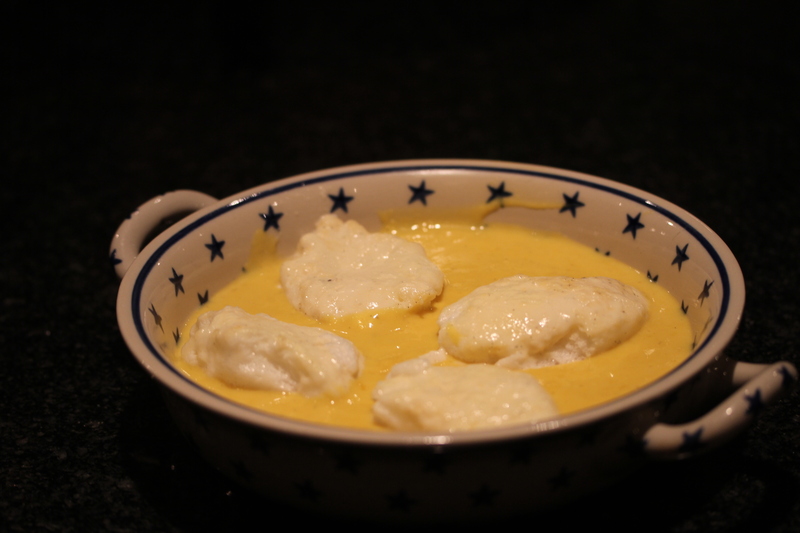 The quenelles are gently poached for ten minutes and then placed on a cooling rack. The egg yolks and sugar are then added to the poaching liqued and whisked together to over a hob until it has thickened to make the creme anglaise. A Floating island is a French dessert, also known as ile flottante. Crème anglaise is thought to have originated from ancient Rome where eggs were used as thickeners to create custards and creams. 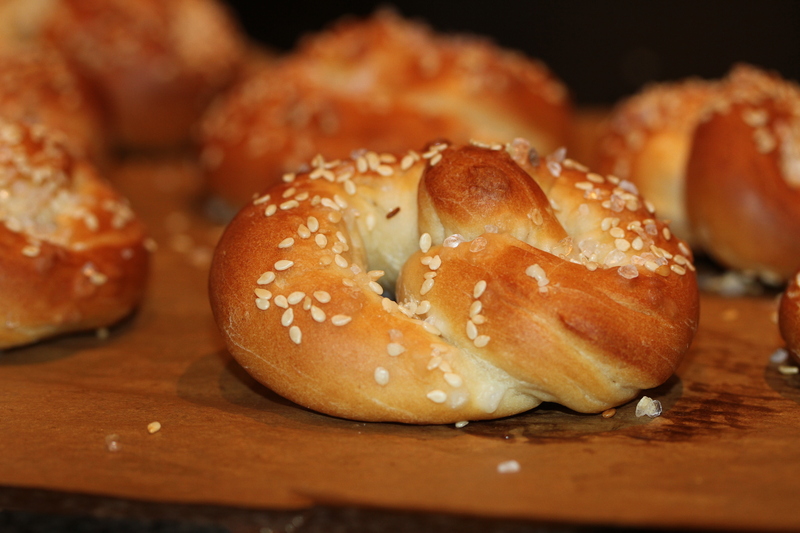 Pretzels, I’m not sure if they are easy or hard to make but I thought I would have a go at them this week so do pop by next Tuesday to see how they turn out. Pretzels all made and eaten. Then a little sprinkle of rock salt and sesame seeds. 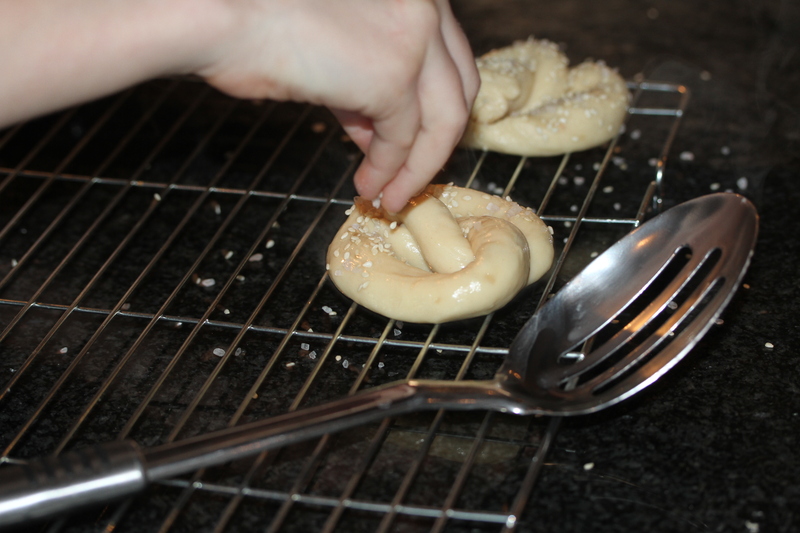 Into the oven for 20 minutes and then you have yummy pretzels. Did you know:- There are different stories as to where pretzels came from but they seem to have a Christian background. One story says that an Italian monk invented pretzels as a reward for children who learnt their prayers. The folded dough is thought to be arms crossing the chest. German and Swiss German immigrants introduced the pretzel to North America in the 18th century. Philidelphia produces 80% of the nations pretzels and a Philadelphian eats about twelve times as many pretzels as the rest of the USA who eat about 1.5lbs of pretzels each year. Wow another week gone by! This week I thought I would try my hand at brandy snaps. Initially I thought I was going to have to get some special moulding tools in but the more I read the more I find I can use items in the kitchen to help me shape the snaps so pop by next week to see what I’ve used and what shapes I’ve come up with!! Brandy snaps all made. I had great fun making them although my first batch went wrong as I didn’t realise they would spread on the baking tray. So it all became one big blob. Once I got myself sorted they started to look like Brandy Snap. I also learnt that a wooden spoon has many uses! 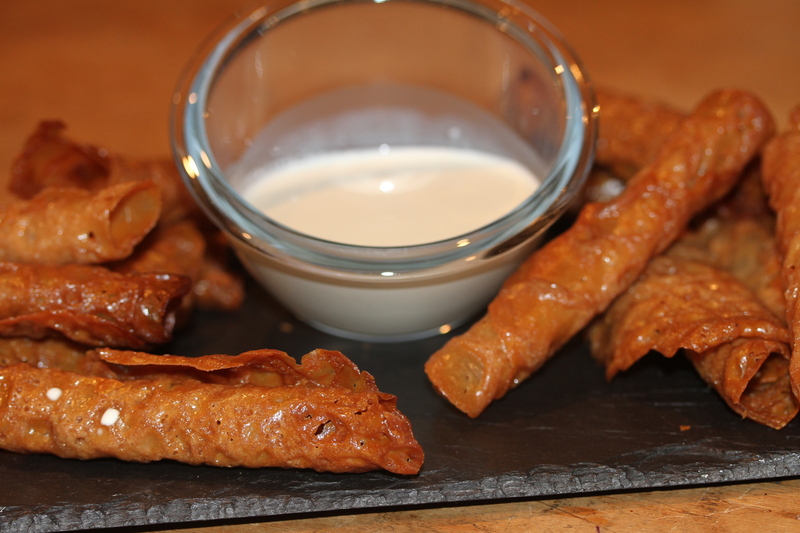 DID YOU KNOW – Traditionally,brandy snaps were made at Fairs and seasonal markets. They were usually made from honey, treacle or molasses. The first record of Brandy Snaps was at the Herefordshire Fair in the early 1900s. There is also a legend dating back to the 14th Century that says the brandy snap was invented by the French or Belgians who called them gaufrettes and they were eaten on market day. Wee I Hope you’re enjoying the Sports Relief Great British Bake off, I’ll be back tomorrow with this weeks bake. Happy New Everybody I hope you all had fun – I had a lovely time at our village hall New years Eve Great Gatsby Party with lots of cocktails (no I wasn’t allowed the alcohol ones!) and dancing. This week I’m going to cook Bara Maen or perhaps you will know them as muffins. I’ll be back on Tuesday but in the meantime I hope your 2014 is full of fun and giggles. I started back at school yesterday and to help motivate me out of bed I’ve been having the muffins I made on Sunday with some lovely honey for breakfast. Unfortunately I only have one left so I guess come Thursday there will be lots of calling out from Mam to check that I’m up!!!! Making the muffins wasn’t quick as you have to let the dough prove and rest so theres a lot of waiting but it was a nice calm bake for a Sunday afternoon. I really liked the soft feel to the dough. 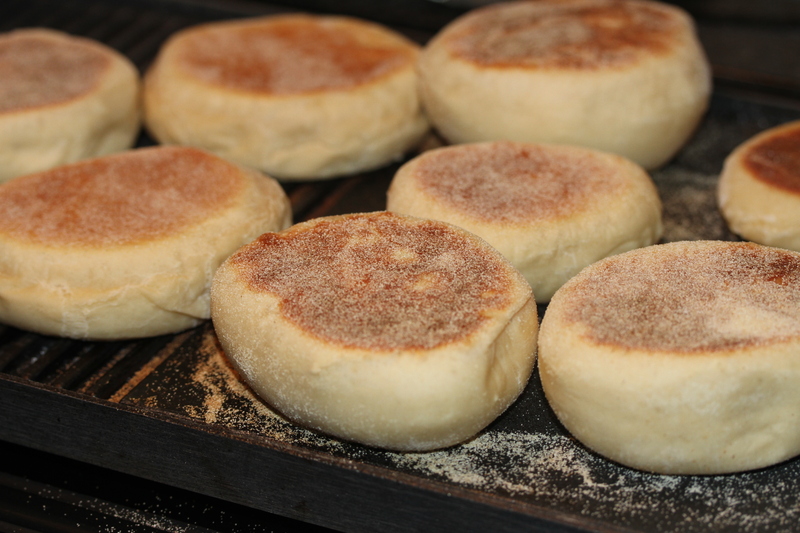 DID YOU KNOW – “English muffins” come from the ancient Welsh tradition of cooking small round yeast cakes known as “bara” [bread] “maen” [stone] on bakestones. “English muffins” were later cooked on a griddle. They say muffins should be spilt with a fork rather than a knife to create a rough surface which will become crunchy after toasting the muffin. Thats me for today and I’ll be back tomorrow with my bake for the week.